Indian hedge fund manager Kalpesh Kinariwala is so sure of his equity strategies in a country that has stumped foreign rivals that he sends a daily e-mail tracker of his performance - including to competitors. Kinariwala's Capveda Capital (India) Advisory fund, which he runs from a modest office in a decrepit industrial estate in Mumbai, has returned 11.86 percent so far this year, outperforming average negative returns of 2 percent from India-focused foreign hedge funds. Local hedge funds are eager to show off double-digit returns in the hopes of drawing wealthy Indians and succeeding where overseas players including HSBC Holdings PLC have failed. Local market knowledge and the lack of foreign currency exposure will favour domestic funds, but it remains to be seen whether Indians would embrace new investment styles in a country that traditionally prefers buying and holding stocks. "It will be very difficult," said Samir Arora, founder of Singapore-based Helios Capital, which manages hedge funds focused on India. "India is a small market, and hedge funds will have to show experience shorting, and they will have to appeal to a high net worth crowd, requiring (costly) distributors," said Arora, who shut one of his India-focused funds called "Jai Ho," named after the Oscar-winning theme song from Slumdog Millionaire in 2011. Investing approaches such as an equity long-short strategy are still a novelty in India, making it harder for hedge fund managers to attract local wealthy individuals. To raise the bar even more, domestic investors are not used to the high fees commanded in the hedge fund industry. Funds also face a high success threshold in a country where plain vanilla bank deposits offer nearly double-digit returns, with consumer price inflation of around 10 percent. To reach wealthy investors, funds are relying on distributors with deep rolodexes who don't come cheap, charging commissions of 25-30 percent of gross earnings in the first few years. In light of the challenges - on top of an unruly rupee - overseas hedge funds have retreated from India over the last few years. Assets under management for overseas hedge funds focused on India have shrunk by 68 percent from 2007 to $2.1 billion in March, according to data from Eurekahedge. percent gain in the broader BSE share index. HSBC was among the casualties, shutting its India-focused fund run by high-profile manager Singapore-based Sanjiv Duggal earlier this year after cash withdrawals from investors. India's regulators have formally approved 10 domestic hedge funds since last year under new rules aimed at organising the industry. Overseas funds are not regulated. Local funds are planning to start small. The average size of funds is expected to be around Rs 100 - 200 crore (Rs 1-2 billion), according to industry players. They are targeting wealthy individuals and corporations, who must be convinced to pay the industry standard fees of 1.5-2 percent for management and 15-20 percent of profits, high by Indian standards. "We will be very selective, probably reject nine out of 10 strategies," said Himanshu Kohli, co-founder of Client Associates, which advises individuals and families on wealth management. "Wealth creation is a relatively young process in India. The biggest concern for investors is to protect their capital," he said. Local hedge fund managers are betting that a vibrant stock futures market would make it easier to undertake shorting strategies. Average daily futures and options volumes on the National Stock Exchange have nearly tripled to Rs 1.32 lakh crore (Rs 1.32 trillion) from four years ago. However, not all stocks can be traded in the derivatives segment. Perhaps the biggest potential cost headache is taxation, given the lack of clarity on whether capital gains duties are to be borne by the fund or by the investor. Kinariwala, who is waiting for formal approval of his fund under the regulator's reorganisation, is not bothered. He is targeting returns of 18-24 percent, more than double the 7.8 percent yield offered by the 10-year government bond, and says his performance will convince investors of the merits of his trading models that he bases on monitoring market momentum. "If somebody is demonstrating a good track record, the sky is the limit," said Vaibhav Sanghavi, who heads a long-short fund at Mumbai-based financial group Ambit Capital, which received a hedge fund license this month. 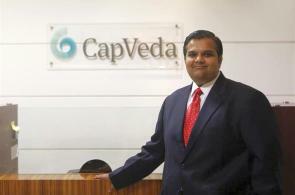 Image: Kalpesh Kinariwala of Capveda Capital (India) Advisory fund.